Haze might first come across as a young and charming post-punk band with one of the loosest and most urgent live shows in the game. But dig a little deeper into what is going on inside the minds of these four lads from Bristol and you’ll probably find historical figures having a booze up with one another while the world falls to its knees in undeserved worship. ‘St.John’ – their brand new single – may be the most natural embodiment of their sound to date if that’s even possible to sensibly classify at this point, yet whats most interesting is their capacity to engrain their songs with these cynical yet scarily valid perceptions of modern life through the madness of their subversions. 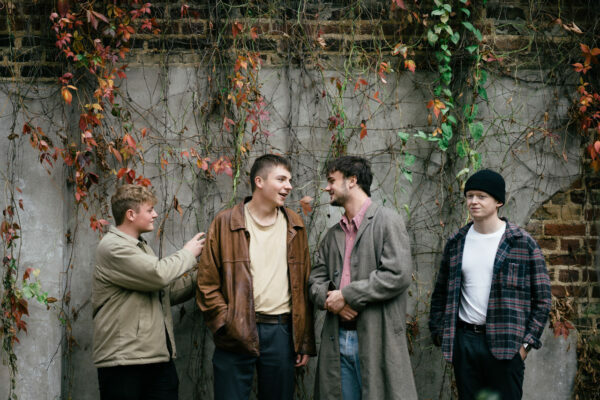 With So Young and Haze celebrating the physical release of ‘St.John’ with a show at The Five Bells on 6th February, we sat down with frontman Will Harrison to discuss finding their drinking limits, bassist Ollie’s hip-swinging antics and having an affair with Frida Kahlo. It’s been an exciting past twelve months for you, I’ve watched you develop into this really urgent and resolute proposition. How do you feel the last year has gone, and how has it inspired your present direction? This year has been a lot of fun for us. We were lucky enough to do a few festivals in summer which were a blast, especially Green Man and Truck (both for the shows and the free tickets). It’s been great sharing stages with some of our favourite new bands, like Squid, and I think we’ve learnt a lot, in terms of performance and writing, from being surrounded by this new creative wave. The two tours we did in Autumn, with whenyoung and Pip Blom, really tightened us up, and made us realise the limits of how much we can drink after each show. It’s also been our first time out of the South. Playing in Edinburgh in particular was amazing, and we were surprised at the warm reception we received up there. I guess its inspired us to want to get back up North as soon as possible. You seem to be inspired by interesting and eccentric historical figures, something that has left an indent on your music and characterised it so. What is it about such personalities from the past that interest you, especially to be creative? ‘St.John’ is really antagonistic and discordant, yet your lyricism channels your sardonic wit into something mocking and satirical rather than outwardly cynical. Do you like to wrap your words into something more poetic for impact? Yeah, St. John on the surface does sound quite angry and serious, like some sort of political statement. The songs narrative is addressed as a series of questions to John F Kennedy, questioning what it’s like to be dead, basking in the veneration he’s had simply due to having been shot, despite a questionable series of policies and dubious morality. I guess it could be perceived as a cynical attack on the guy, but I think of it more as a rhetorical device. Although about JFK, its more about the present day – how we judge todays public figures against a glorified past. Lyrically I’d say it isn’t particularly poetic, one of my blunter ones, but one that is still (trying to be be) light-hearted and funny (which is perhaps lost in the aggressive delivery and music, thinking about it…). It’s a brash yet vital satire on society’s obsession with “national treasures” who have passed on, in particular politicians who people are almost nostalgic for in comparison to todays leaders when in reality they are all as bad as each other. Do you think that our obsession with yearning for “happier times” is impacting negatively on the way we live today? I think the whole ‘good old days’ idea generally is pretty flawed wherever it arises. It seems to be usually based on some flawed construction of an imaginary past. You can see it when people look back to the ‘good old days’ of empire, and use it to justify contemporary racism, when people talk about a supposed ‘snowflake’ generation compared to a stiff-upper-lip past, and when people say all music is shite nowadays. All of these views, based in a fictitious perception of what’s gone before or what’s been lost as times gone on, make certain claims about today which too are questionable. God that sounded pretentious. It feels like your live show is where you are particularly in your element, capturing the vitriol and raucousness of your music and perspective and letting it loose. Is it an important form of performance for you? Playing live has always been where we at most at home musically. We record basically everything we do live in an attempt to capture this energy. When we try and record separately it effects all our performances, and loses what makes us a band I think. Above all, playing live is just us having a great time together, as mates. Ollie, our bassist, goes particularly mad on stage. His hip-swinging has become probably the biggest positive comment we have received recently, people seem to love it, in some strange way. I also think it helps get across that the songs themselves are not particularly serious, a good counter to the directness of the music. With your presence rising, do you feel like you have a set direction that you want to take for the future, or are you working within open playing field and is the reception that you are receiving affording you that opportunity? I think we’re pretty open with everything, just trying to play as many gigs as possible, and get writing more again. There’s some songs in the set that we’ve been playing for a bit too long I think. Although we always have fun playing them, and are still very much attached to them and the times in which we wrote them, I think it’s probably time they are displaced by the new ones we’ve got brewing. I don’t think we’ve been writing in a way that is directed at a perceived audience, or are too worried about how they’ll be received. We love the new ones, so I think we’ll perform them with more energy and excitement, which is when we seem to go down best. Haze celebrate the physical release of their single with a part at The Five Bells on 06/02/19. Get your tickets here.